San Diego Symphony Principal Bassist Jeremy Kurtz-Harris has a diverse musical background that includes solo, chamber, and orchestral performance, and an interest in jazz and folk music. He is the winner of numerous competitions, including the 1997 International Society of Bassists solo competition, and was the only bassist to be featured in Strad magazine’s January 2000 “New Century, New Talent” issue. 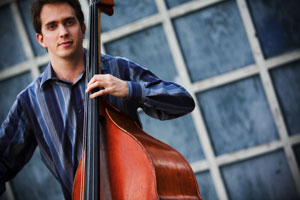 His extensive recital experience includes performances in Houston, Memphis, Philadelphia, San Antonio, San Francisco, Toronto, and appearances at several International Society of Bassists conventions. He has appeared as soloist with New Jersey’s Riverside Symphonia and the Chamber Orchestra of Philadelphia. In addition to La Jolla SummerFest, Mr. Kurtz-Harris has performed chamber music at the Banff Centre for the Arts, Carnegie Hall’s Weill Recital Hall, Kennedy Center for the Performing Arts, and the Verbier Festival in Switzerland. A graduate of the Curtis Institute and Rice University, his teachers have included Harold Robinson, Timothy Pitts, and Paul Ellison. His wide musical interests have also led him to study with such diverse artists as jazz bassist John Clayton and classical/bluegrass bassist-extraordinaire Edgar Meyer. In addition to his performing pursuits, Mr. Kurtz-Harris is a member of the board of the International Society of Bassists.